I'm posting this a day late, I'm afraid. It appeared in the Canberra Times on the morning of the vote. Nothing more to be said, really. Nobody needs me to tell them how to vote. Regular readers of this column are, almost by definition, intelligent and discerning; you will have no difficulty picking a fake counterfeit from the false forgery. Of course, it’s not the leaders we vote for and, at least in the Times’ normal circulation region, the result is pretty much pre-ordained. In the ACT, Labor MP’s Gay Brodtmann and Andrew Leigh will be keenly watching the size of their majorities. Their scrutineers will note any comments scrawled on the ballot paper but please try to keep these down to merely a helpful sentence or two, rather than an epistle that might encapsulate how you really feel. Some of his former colleagues, for example, may wish to ask Professor Leigh why his party cut higher education funding? These results are, nonetheless, pretty much foregone conclusions, as is the ACT’s Senate vote. No matter how great the disillusion surrounding the squalid way Zed Seselja unseated Gary Humphries, he will be returned as the Territory’s second Senator. And welcome back (again) Kate Lundy, occupying Labor’s seat for seventeen years now. Goodness, what a long time. These are, however, good people. Many voters may seriously doubt the capacity of the respective party leaders and yet vouchsafe these members their trust. Similarly over in Hume to the west, where the young, dynamic and intelligent Angus Taylor will (almost inevitably) replace Alby Schultz as the Liberal member. But if the way some seats will fall seems obvious, the situation to Canberra’s east in Eden-Monaro is much more uncertain. The bellwether marginal’s representative has, since 1972, always sat on the government benches and that’s where Labor’s Mike Kelly is today. It’s also why the Liberal’s Peter Hendy could expect to be elected almost automatically. After all, that’s what voters in the seat do. This time, however, he can’t be that can’t be certain and the result will prove just how important the local member’s personality can be. A former military lawyer, Kelly’s larger than life. He’s got some great ideas for reforming our defences too, although he won’t get a chance to put those into practice from opposition. His warmth has earned him a large personal following and he’s a very different character to his opponent. Hendy originally came from Peter Reith’s office and then he became CEO of the Australian Chamber of Commerce and Industry. He was a key driver behind Workchoices. That’s why his opponent brings this issue up whenever they appear together, although Hendy’s been dodging media appearances with Kelly lately. That’s probably a clever strategy for him, because the last thing he wants is a local fight. 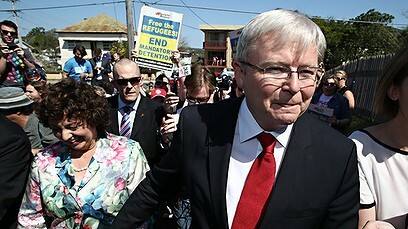 As long as the focus remains on Rudd, he’s got it won. If the Liberals had a local candidate who’s wasn’t so divisive, they’d be more confident. Nationally, after the election – whatever the result – Labor and the Greens are going to have to find a new way to live and work together. It will be interesting to see by how much the Green vote declines nationally, because that will provide a clue to the future direction of the broader left. As usual the Greens will proclaim how ‘close’ they came; how they nearly achieved a ‘surprise’ result; and that’ll be it. Until next time, when we’ll go through the whole charade again. What the pollies are really after is the funding. Every scrawled “1” is worth a bit over $2.48 (or $4.97 for the Senate and Reps combined). All a candidate needs to do to qualify is receive more than four percent of the vote. This is, of course, a way of boosting the coffers of the big players. That explains why they voted themselves the money. It ensures they (and people like Clive Palmer) can effortlessly outspend minor groups campaigning on specific issues. The key for the Liberals is going to be the size of the swing. It’s just like the tide; when it’s receding away (as it is from Labor at the moment), nothing, perhaps not even good local members, can turn it round. Equally, if you catch the wave at the right moment it’s possible to surf it in like a pro – it’s all in the timing. So what to say at the party tonight? Firstly, watch the number of informal votes. If (as I suspect) this is down on last time, pontificate about how, last time, Labor’s voters weren’t convinced by Julia Gillard but now they’ve decided to vote against Rudd. Watch imbecilic local candidates like Jaymes Diaz. He couldn’t explain Liberal policy about stopping the boats; but will this be enough to stop the votes as Abbott brings the water in? Or how about Fiona Scott, another Liberal, Western Sydney candidate, who’s worried about all the traffic congestion that could be caused by asylum seekers? Oh, and Page and Barton. If Labor saves these, then the change to Rudd will have been worthwhile. Otherwise it was a self-indulgent disaster. The irony is that neither of these people would have been Tony Abbott’s choice for his candidates in these must win seats. Still, we all have to take what we’re given – like it or not.